According to a Martin Brinkman blog post here, you can still get the free Win10 upgrade. If this is true, can you also do a clean install of Win10 and use a Win7 or Win8 Product Key? Presumably the same activation process will still work as before and the trick of simply booting from a USB drive to Win10 will still work. P.S. 2016-08-05 I booted to Win10 TH2 Pro on a Windows 7 Ultimate system today and used the Windows 7 Ult key to activate it - it worked fine! Here is the .mnu file for the PMagic 2016 ISO with the SAVE feature supported. Here is how I modified SDI_CHOCO on my E2B drive so that instead of using Snappy to install generic drivers, it installs all the correct official Lenovo drivers and applications. New user files are created by the end user to modify the install behaviour, so updating E2B to the latest version will not delete these new files because only the original E2B files are updated. If you have several different models of PCs and Notebooks to install, then the XML file and SDI_CHOCO folder structure should be duplicated, renamed and modified accordingly, for each different model. This is a new, slightly tweaked version of the previous SDI+Choco version. It is available in the Alternate Downloads Areas as usual. Read the previous blog post for how to get it working. It now includes sample XML files for Win 8.1 Pro, Win 8.1 Home, Win 10 Pro and Win 10 Home for both USA and English International versions of the ISOs. You can remove the E2B USB drive when you see the CAPS LOCK and SCROLL LOCK LEDs lit. I have added better logging and tidied up the cmd scripts a bit. There is a little surprise added too - leave a comment when you find out what it is! Note: If you have modified any of the original E2B files in the \_ISO\WINDOWS\INSTALL folder (naughty, naughty! ), then when you update E2B with this new version, it will obviously overwrite your modified files. So rename any folders you want to keep first. if you have some Driverpack downloads in the SNAPPY folder, they will not be affected when you update. E2B v1.82SDIa_Beta is available for download in the Alternate Download Areas. Once you have downloaded and added the driverpacks, you will be able to perform a fully automated install of Windows with all drivers and any apps you want too, using an unmodified MS ISO and one of the xxxxxxx_CHOCO_SDI.XMl files on your E2B USB drive. 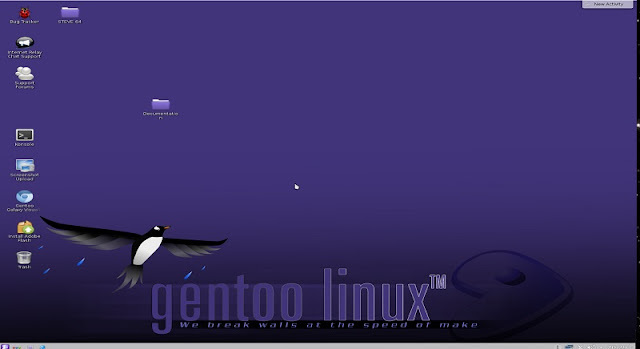 Here is how to boot from a Gentoo ISO file with persistence. 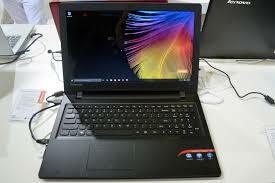 I used the livedvd-x86-amd64-32ul-20140826_gentoo.iso download. The cheat code needed is in the form aufs=/dev/sdX3 where X is the USB drive. Since the USB drive number will vary from system to system, we have to try to guess what Gentoo will assign the USB drive as! QR code contains the URL of 'List of tested payload' page on E2B website. As always, just download and extract E2B to an empty folder and run the \UPDATE_E2B_DRIVE.cmd file to update all your E2B drives. $$AddWin2Main.mnu bugfixes for direct booting of Windows Install ISOs from Main menu. Bugfix for .isope path problems and + make work if iso on 2nd partition (note: .isoPExxx extensions only work correctly on Removable Flash drives, otherwise convert to .imgPTN files). SWITCH_E2B.exe v1.0.12 bugfix for syslinux booting (also supports .imgptn*2* as well as .imgptn*23* extension for special users - .imgptn*2* is NOT supported by E2B though!). Which USB 3.0 SATA disk drive enclosure is best for E2B (six enclosure shoot-out)? USB 3.0 controllers are designed to operate at fast speeds, so it makes sense to buy a USB 3.0 drive enclosure, even if you are going to connect it to a USB 2.0 port. Because I do a lot of work with USB drives, I mostly use a USB 3.0 drive caddy containing an SSD hard disk for maximum speed. I also use a UASP HDD enclosure to get the best possible speed with an SSD drive under Windows. I detailed in a previous blog here, how to create and modify an XML file to fully automate the installation of Windows 7 and 8. The process is identical for Windows 10. You need to specify a Product Key in the XML file (same as Win8), although not all ISOs may need it (e.g. some MSDN or Volume Licence ISOs). If you have an ISO file which contains bootmgr and boots to WinPE, then you can use it with E2B by renaming the file extension to .isoPE or .isoPE01. This only works if you have a Removable E2B USB drive (you should convert the ISO file to a .imgPTN file if your E2B USB drive is of the 'fixed disk' type). Note: There was a bug in previous E2B versions when using .isoPE and .isoPE01 file extensions (the blue LOADISOPE.cmd console window stopped with an error and the ISO was not loaded). You will need a recent version - e.g. E2B v1.81 Beta from the Alternate Download Areas (see side bar). However, if you use the .isoPE file extension, it will cause E2B to immediately load and run bootmgr and so the ISO will boot straight to WinPE and you won't see the non-Windows boot menu, if one was present inside the ISO. 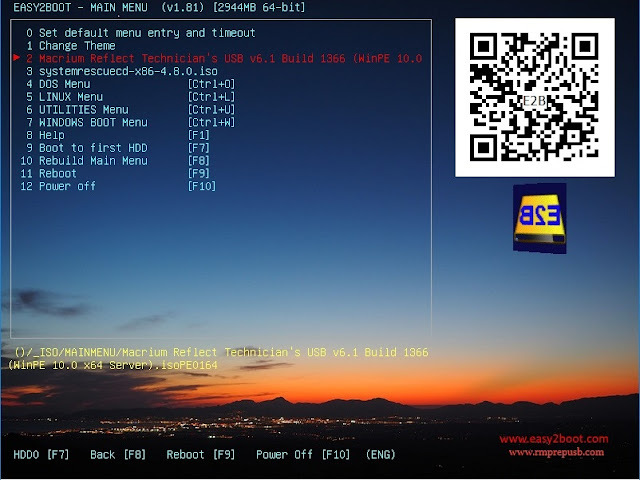 Make a basic Easy2Boot MyE2B.cfg configuration file. If you already have an E2B USB drive, you can easily update it by downloading the latest version of E2B and then run the UPDATE_E2B_DRIVE.cmd script. Newer versions of E2B have a new version of the MAKE_E2B_USB_DRIVE (run as admin).cmd script, so that when you make a new E2B USB drive, it also asks you some questions about how you want to configure E2B - e.g. language, keyboard, if you want the file extension to be displayed in the menus and if you want the rotating E2B logo to be displayed (with Boiler Plate or QR code). If you have already made your E2B USB drive, you can run the same script to create a new \_ISO\MyE2B.cfg file by running the \_ISO\docs\Make_E2B_USB_Drive\Make_MyE2B.cfg.cmd script. It will ask you to select a USB drive and then will run through the same questions that MAKE_E2B_USB_DRIVE (run as admin).cmd asks. E2B v1.81f will allow you to add a QR code 'STAMP' to the menu wallpaper when you run \MAKE_E2B_USB_DRIVE (run as admin).cmd to make a new E2B drive. The QR code contains the URL for the E2B website's 'List of tested ISOs/payloads' page, so you can use your mobile phone's QR reader to quickly look up the recommended way to add any payload to your E2B drive if your first attempt did not work!